Henry County’s unemployment rate for June was 4.7 percent which is up 1.1 percent from May’s 3.6 percent. Unlike the statewide unemployment rate, county unemployment rates are not seasonally adjusted to account for seasonal fluctuations such as yearly school closings. The county rates incorporate seasonal workers who are temporarily unemployed. Between May and June of this year, education service jobs were down by 38,000. These are custodians, bus drivers, and other school support staff who are not working during the summer months. Davidson County experienced the state’s second lowest unemployment figure with a rate of 3.1 percent, up from of 2.2 percent the previous month. 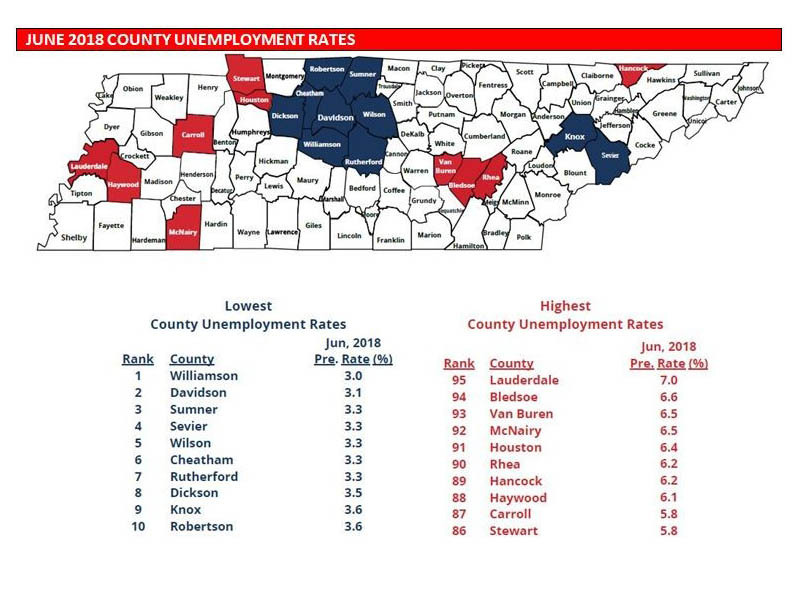 Lauderdale County had the most unemployed residents in Tennessee during June. Its jobless rate of 7.0 percent is up 1.7 percent when compared to May. Bledsoe County had the second highest unemployment in the state last month. At 6.6 percent, unemployment in the county grew by 1.7 percent from the previous month’s figure. Tennessee had a seasonally adjusted statewide unemployment rate of 3.5 percent in June, which mirrored the rate from the previous month. Nationally, the seasonally adjusted unemployment rate experienced a slight increase to 4.0 percent, up 0.2 of a percentage point from May’s revised unemployment rate of 3.8 percent. Tennesseans who are searching for employment will find a variety of valuable resources on the state’s workforce website. A complete analysis of Tennessee’s county unemployment data for June 2018 is available here.